To minimize the possibility of damage from overhead work, the sunroom and skylights are installed before the roofing and after the clerestory and siding have been completed. Most sunrooms are available as kits with screens and glass set in an aluminum or vinyl frame (see the Better Living Guide to Sunrooms). 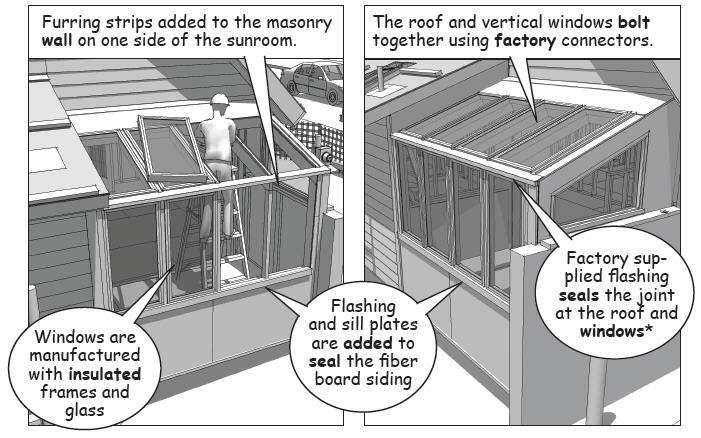 These kits are sold by authorized contractors and are by far the easiest way to install a sunroom. 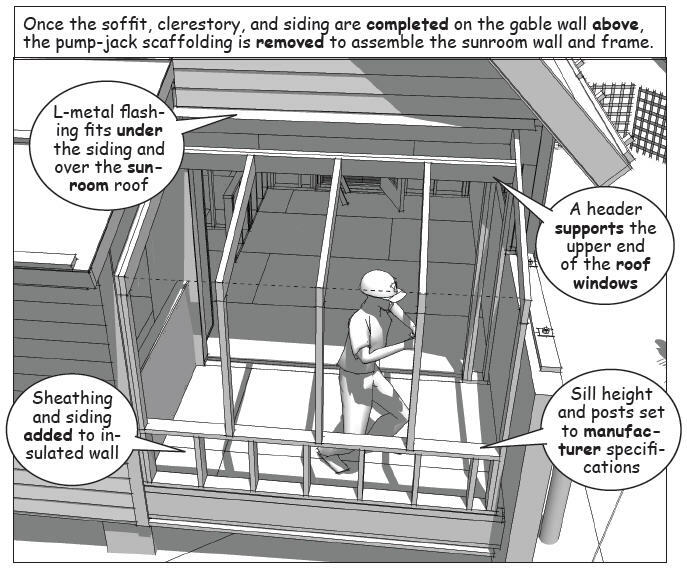 In this example, a custom-made sunroom is field constructed by skilled finish carpenters to fit an existing opening. Note that local codes may require detailed engineering drawings or specific factory labeling, indicating test results for positive and negative design pressures. The frame must be weather resistant, carefully joined, and treated with a sealant and stained or painted before the glass is installed. In most climates, a clear, vertical grain pressure treated wood or composite, similar to that used for exterior decking, is the best choice for the framing material. The rafters and stops are routed to secure the glass and are spaced to match the size of standard insulated and tempered glass panels. These panels are similar to those used for window walls in commercial buildings and are sourced from the same suppliers. 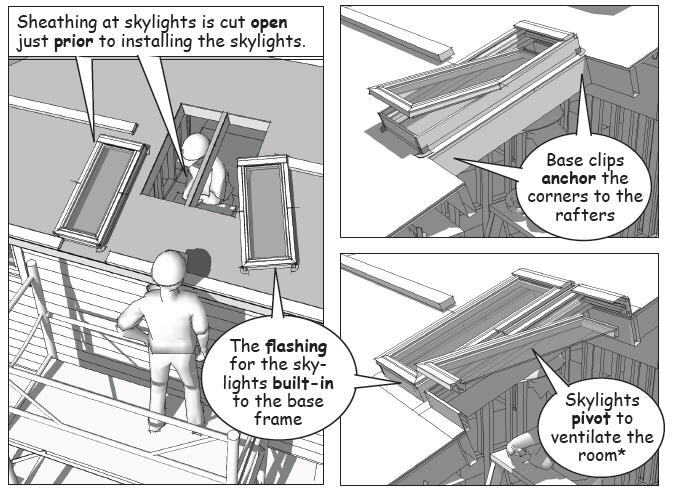 Skylights are often specified to replace windows in small rooms that require daylight and natural ventilation and are manufactured to meet energy and building code requirements. 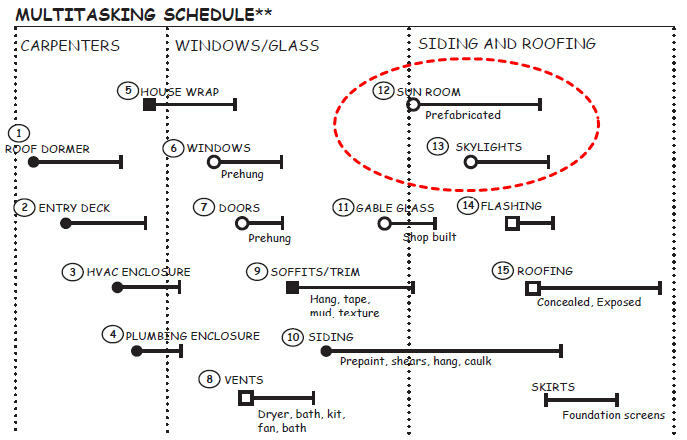 Operable skylights must be placed away from nearby plumbing and exhaust vents to prevent cross contamination and the intake of harmful gases. Required distances are governed by local building codes. 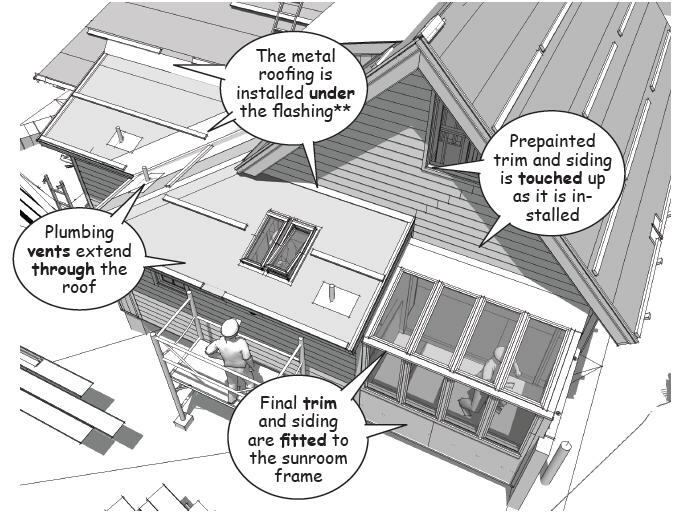 When the unit is ready to be bolted to a curb that was built around the opening in the roof, flashing is installed by the roofing contractor, and the prefabricated flanges of the skylight frame are set to counterflash the roofing material and seal the opening. As an alternative, flush mounted skylights are available to avoid ice or debris buildup against the curb, improve energy efficiency, and lower the visual profile of the unit on the roof (See especially www.velux.com).